Mainstream Windows 7 Support ended on January 13, 2015. This basically means Microsoft stopped adding new features to Windows 7. Once Mainstream Support ends Microsoft continues providing critical security updates for approximately 5 years so that users who are slow to adapt change can do so. In approximately one year (January 14, 2020) Microsoft will end all support for the Windows 7 Operating System. This means any new security issues that are discovered will not be patched leaving you with increased vulnerability to viruses, malware, and ransomware! While a lot has changed in Windows 10 most have been for the good. Windows Updates are pretty automatic and can only be paused for a short amount of time (35 days) before they are automatically downloaded and installed again. This can be changed but it requires editing the registry and I highly advise against this as these updates are often critical security updates. Windows Update handles drivers beautifully for the majority of systems and upon a fresh install after the first round of updates most drivers are installed and devices will operate as desired. Some non-mainstream device manufacturers may require downloading drivers from their site and this is usually a straight-forward process. Only if you are having specific issues with a device do I recommend straying from the Windows installed drivers. 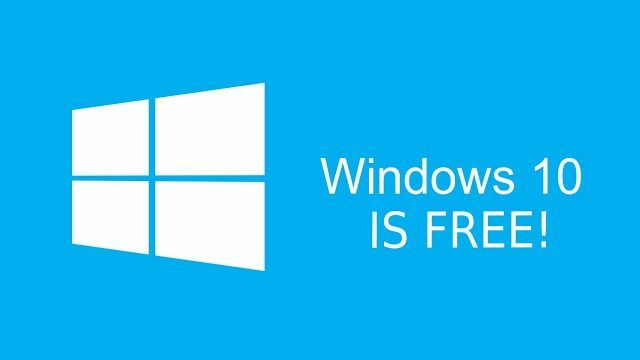 For a period of time Microsoft heavily pushed its free upgrade to Windows 10. Many users declined this offer and stuck with the Windows they knew and loved. Now that support is ending many users fear they must either discard their old PC or pay $100+ for a Windows 10 license. Well fortunately that is usually not the case! The minimum system requirements for Windows 7 are equivalent to that of Windows 10 and when you upgrade from 7 to 10 it evaluates your software for any potential conflicts with Windows 10 and allows you to remedy any potential issues. What Microsoft doesn’t advertise is that a valid Windows 7, 8, or 8.1 license is also valid for Windows 10! This means is that if your PC is running a genuine version of these Windows you can upgrade for FREE! To get this free upgrade simply navigate to the Windows 10 Download page, choose ‘Download Tool Now’ under the ‘Create Windows 10 Installation Media’ heading, and run the program after it has finished downloading. You can then select ‘Upgrade This PC Now’ and begin the upgrade process. Upgrading keeps all of your programs and files! If you are upgrading multiple computers or want a clean install you can use an 8GB USB flash drive and create your own install media. Note: When doing a clean install, instead of an upgrade, you will be asked for a Windows 10 license key. Here you can enter your Windows 7 key which will activate Windows 10 for you. If you are using Windows 8 or 8.1 and do not have a sticker with the key number on your PC then the chances are that it is embedded in your systems mainboard’s BIOS. Here you can choose “I don’t have a key” and skip entering one. When Windows starts up it will read this key and automatically activate your copy of Windows 10. First off, Microsoft licensing is extremely complicated and they have created an entire certification and exam just for their licensing! Most Microsoft employees will not even answer licensing questions because most of them honestly do not know themselves. The simple answer is Yes… if you’ve used an ‘Assistive Technology’. Although this is never checked for in order to make your upgrade completely legitimate according to Microsoft before upgrading you should use an ‘Assistive Technology’. To do this simply go to your Control Panel and use the Screen Magnifier, Speech To Text, or other Assistive Technology! Regardless as to whether you do this or not installing/upgrading and connecting to the internet Windows 10 will talk to Microsoft’s activation servers and they will accept and validate your Windows 7 / 8 / 8.1 license and certify your install as Genuine. As we shared earlier, we’ve extended the free upgrade offer for those who use assistive technology as we continue to make accessibility improvements to Windows 10, including many coming in the Anniversary Update, which is available after the free upgrade offer ends. You may see the Microsoft Accessibility blog here for more details. Essentially Microsoft has ended formal support of all Free upgrades however the loophole still remains and Microsoft isn’t concerned with End Users doing a free upgrade to Windows 10. You can read more about this in this article from Forbe’s website.